Hi everyone! I thought it was about time I contributed a post of my own to Sewing 101. I have been so gratified with the response to this series, and have learned so many great tips myself. Learning to sew is a lifelong process. Recently I purchased my own pair of pinking shears, on clearance at Michaels for less than $10. It was a deal I couldn't pass up! Pinking shears are specialized scissors that cut fabric in a serrated pattern. The dress has been washed a few times, so you can see how the seams wear over time. Pinking prevents fraying past the triangles. Another great use for pinking shears is to prevent lots of unraveling when you pre-wash your new fabric. Just pink all the raw edges before you wash.
My new favorite use for my pinking shears if for trimming around curves. I first discovered this option when making Molly Monkeys last summer. There are lots of curves for Molly...including her shoes! So, instead of painstakingly clipping little triangles out at the curved edges (so that the seam lies flat), I trimmed the edges with my pinking shears. I also used this for making my baby's fairy wand. If you have access to pinking shears, they are a great tool for your next sewing project! Linked up to Under the Table and Dreaming, and The Girl Creative. p.s. Larissa at mmmcrafts came up with another fun pinking shears project HERE. Great round up Chris & I really like this series). I splurged and purchased a really good pair of pinks in July 2009 (recall the day!) and never regret. Another nice idea is if you are creating felt flowers, you can pink a circle center and it looks really nice - a little more natural. Thank you for the post. I'm going to start using them more often. When I was growing up my mom made a lot of my clothes and while I loved them, after a few washings, I would often get my fingers or toes caught in the threads of the fraying inseams. No longer! A very informative post for all those who love to SEW, and I am in one of. so Thanks a lot.. So happy this is helpful to you all! I love to sew, and want to encourage others to give it a try. I love my pinking shears! Thanks for the idea of using them around the corners...I noticed that in your wand tutorial. I will be doing that for sure! Good reminders and new ideas as well Chris! Thanks so much. 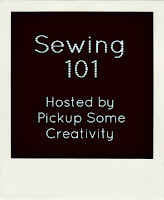 this is how i found ur blog with the sewing 101 series. can't wait to learn more! What a time/sanity saver for snipping around curves. Thanks for the idea! My mom had a pair of these and I loved using them as a kid! I totally need my own now! That monkey is so very cute! Those little shoes are adorable. Great post and great tips. I'm in love with my pinking sheers, but I just learned of new ways to use them! I must get a pair of pinking shears onto my Christmas list. Time to start dropping big hints, I think!! Benn poking around your blog and you have some great project Ideas! Love the modged podged clip boards! Very cute. I have to get me some of those scissors I have kids little craft ones, but not for fabric....they look so cute too.